Wouldn’t it be nice to know how many people actually visited your blog each day? How about knowing which of your posts are the most popular? Well surprisingly Blogger doesn’t currently offer any native blog analytics but fortunately there is Google Analytics — available for free. Google Analytics is a great tool that will show you all sorts of useful information about how people found your blog, keywords they searched on to find you, where they came from and even how long they stayed. You’ll learn more about where your visitors come from and how they interact with your blog. This is a must tool if you are trying to build a profitable blog otherwise you are flying blind! 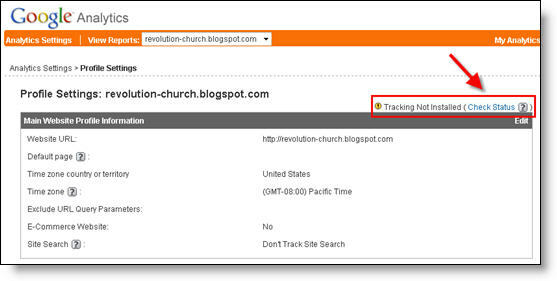 This article will show you how to add Google Analytics to your Blogger blog. It’s a fairly simple process and doesn’t require any technical skill at all. Your last step in signing up will ask you to accept the user agreement terms and conditions which you should read (just kidding…who actually ever reads these entire legal terms anyhow?). Now this next screen is very important. This is the code you will need to copy and paste into your blogger template. Go ahead and click into the box and it will automatically highlight the entire block of code for you. Now you need to copy that code and paste it into notepad or into a MS Word document. Save it as you’ll need to use it later. 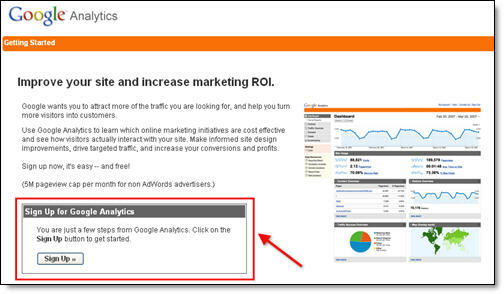 After you click on the “continue >>” button you will be taken to your brand new Google Analytics dashboard! You will see your blogger blog listed but with no analytical data….yet. 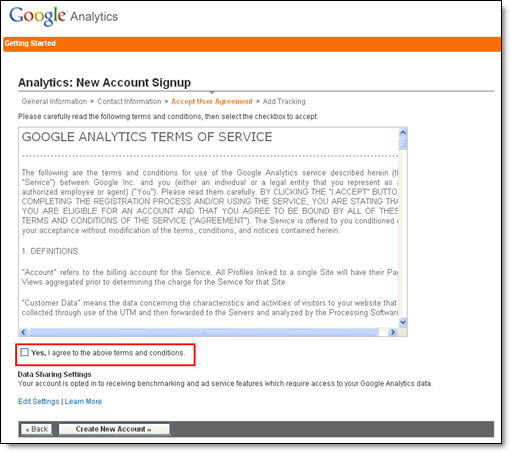 Ok, now you are done with setting up your Google Analytics account. The next step is placing the tracking code into your Blogger template so it can report back to Google Analytics and provide you with some cool data points. This is not a very difficult step even if you are afraid to touch your template code. Login to your Blogger account and then click on the “Layout” => “Edit HTML” tabs. This will bring you to the template code. Before you make any changes, I advice you to back up your template just in case there are any problems. After you’ve done so, continue reading. Now in the edit template html code window, scroll all the way to the bottom of your template code and look for the </body> tag. There should only be one of these closing tags in your template. If you can’t find it then your template wasn’t properly created and you should add one right above the </html> tag.The </html> tag should always be your last line of code in your template. It signifies the end of your template. Ok, now go back to the code you saved before in a Word Doc from Google Analytics. You are going to copy it and paste it right above the </body> tag as illustrated in the image below. The yellow highlighted code is the new GA code I just pasted into my template. Save your template and you shouldn’t get any error messages. If you do, it’s most likely not related to this GA code and something else with your template itself. Assuming you’ve been successful with your save, you are all done embedding the GA code in your template! Go back into your Google Analytics account and look at your dashboard. Most likely you will see a little yellow exclamation mark under the “status” column that looks like this: . This means everything isn’t working properly yet which is fine because we are about to tell GA we just added the code. From your dashboard, click on the “edit” link which is located to the far right. After you click on that link, you’ll see another screen like below. It will say “Tracking Not Installed” followed by a link “Check Status”. You’ll want to go ahead and click on that link which will tell GA to visit your site and look for the new code you just pasted in your template. 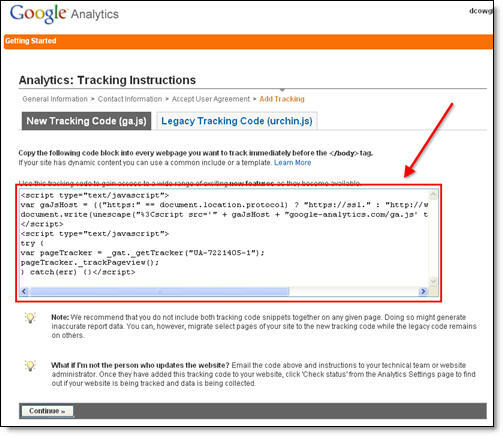 Assuming you pasted the code in there as instructed above, GA will find the new code and begin tracking everything on your blog. If you are still having problems, it’s most likely something to do with GA and you should read their help guide to troubleshoot your problem. The message seen here, “Waiting for Data” means you have correctly setup GA and data is being gathered! 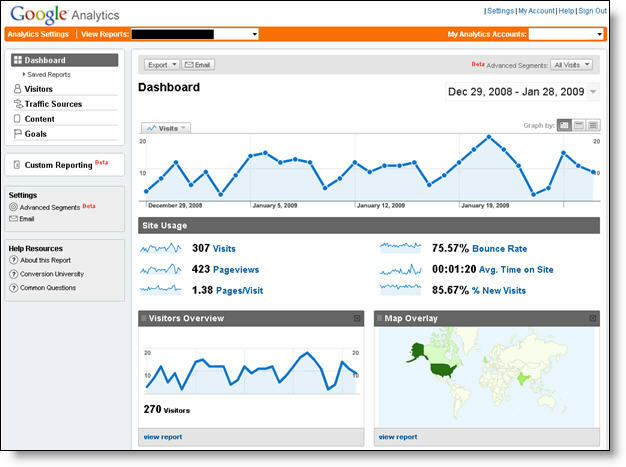 Click on the top left Google Analytics logo and it will take you back to your dashboard. From there click on the “View report” link and that’s where all your very important Blogger visitor data will start appearing! Now it usually takes an hour or so before you will see any data (maybe longer if you don’t get much traffic to your blog) so please be patient. Trust me, you’ll be logging in at least once a day just to see how much traffic your blog is getting. It’s very addicting and powerful information to learn from. You’ll be surprised which posts are your most popular and what countries people are coming from to read your blog. Google Analytics is very powerful and we have just learned how to install it into your Blogger template. We haven’t even scratched the surface on the features and reporting it can do. For most Bloggers, this will be enough. Data will be collected and you will just review it. Others with more in-depth goals (like selling products or services, creating a sales funnel, etc) will want to spend more time learning GA. Hope you enjoyed the tutorial and don’t blame me for your new found addiction! Great article. When working with blogs an social media, the lack of real time reporting in Google Analytics can be a problem. thanx for this intro. i was really scared to fumble on my blog script but it worked. great. i still wonder what the warning in GA is about not using the old statistics script. too tech for an amateur. nevertheless thanx for providing this help. Perfect. Thanks a lot. Great tuto. Thank you for sharing this and making it so easy to understand! Google’s tutorials were of no help. Yours were great and the screen caps made it very easy to know I was doing the right thing. Thank you for taking the time to share this. I am sure it has much more than the 300 commenters who have posted so far! Thank you very much for adding the bit at the end on how to get GA to update the status. I thought I had entered the code incorrectly until I read this. everything is working great now. TRIED this but the Green CHECK did not happen to me, I got a white clock on that position.. still need help although I did everything perfectly. THANK YOU SO MUCH!! SUPER HELPFUL!! It will not allow me to add before the last html. If I insert it the message I’m getting is: “Your template could not be parsed as it is not well-formed. Please make sure all XML elements are closed properly. XML error message: The element type “html” must be terminated by the matching end-tag “”. 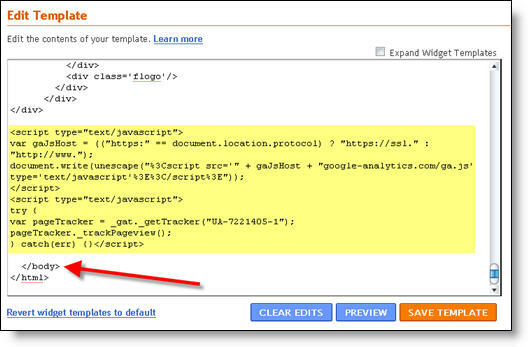 Why does google analytics tell me that I should put the script immediately before the tag? Does that make any difference? Excellent post with some great information. I now finally have Google Analytics added to my blog thanks to you. Keep up the informative posts! Too bad Google doesn’t have such an easy and helpful document to figure out the status of installation. Thanks! big help for us. Thank you for sharing. Sent from heaven! Thanks so much. This was complete and beneficial. Hello! Thankss soo much for this! Hm, maybe I’ll regret it why I didn’t install GA before. Hehehehe. Just have to see how it’s going to work out, just finished the setup! your blog is really helpful for me. i have installed GN in my blog by your assisting blog. so i am eager to find how GA work. Now I have Analytics on my Blogger blog! I prefer Analytics than the Blogger Stats! I had a slight hiccup, though, it was not to do with your instructions which I found to be incredibly clear. Thank you very much. I looked at other sites but none were as clear as yours. Thanks for keeping it simple and using the pictures. such a great guide. thanks so much just installed code in my blog. Many thanks for such clear help! Thank you. The process is wonderfully explained – was very easy to understand cept the part where I’d to search for “Layout > Edit Template” tab. I couldn’t find such a tab – but when I checked the “Design” tab under “Setting”, I knew what you were talking about. Thank you! Success! Really appreciate the explanation in layman’s terms, I am the ultimate newbie. Thank you very much. This was very helpful and most importantly it was accurate. Really appreciate the help. This was easy with your step by steps. Thanks. Hi, This post is really helpful to new blogger as well as experienced. The presentation of post is very clear to understand. Thanks. I learned to Install Google Analytics from this page n Now have a really good Analytic Stats n Views …. will it work if I just post the code in a HTML/JAVA script gadget in my sidebar?? really very help full thank you for sharing. Thank u so much for this tutorial. I’ve tried a number of tutorials online but they seemed to have not worked for me. I tried yours and I’ve done it pretty fast. Thanks a lot! One more question though…how to add another website under the same account? Thanks so much. I looked at three different “how to”s and yours was the best! Thanks for the informative article, very helpful! Very Helpful post…. Thank you very much.